Today, I'm reviewing the classic film noir The Spiral Staircase (1946), starring Ethel Barrymore (left) and Dorothy McGuire. This article is part of The Second Annual Barrymore Trilogy Blogathon hosted by In the Good Old Days of Classic Hollywood. 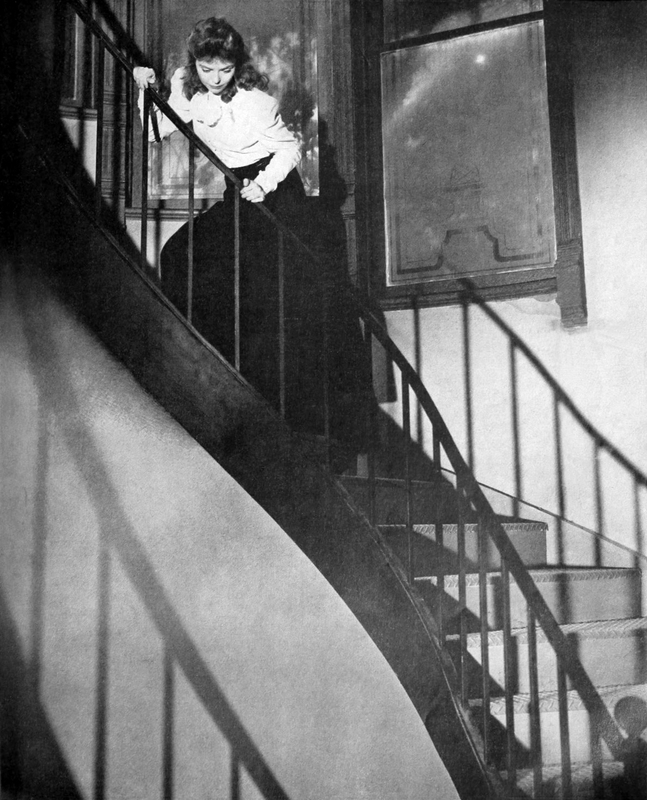 One of the happiest onscreen experiences for the great actress Ethel Barrymore was making The Spiral Staircase (1946), a classic film noir/horror film that is a twisty tale of murder and deceit set in small-town New England. The Spiral Staircase tells the story of Helen (Dorothy McGuire), a mute girl in turn-of-the-century New England who works as a caretaker for an elderly invalid, Mrs. Warren (Barrymore). In the past few months, the townspeople have been terrorized by a series of murders involving disabled women, and Mrs. Warren, fearing Helen will be next, urges her to pack up her bags and go with the local doctor (Kent Smith) to Boston for treatment. However, before Helen can leave, she finds herself caught in a desperate struggle for survival with an unknown assailant. 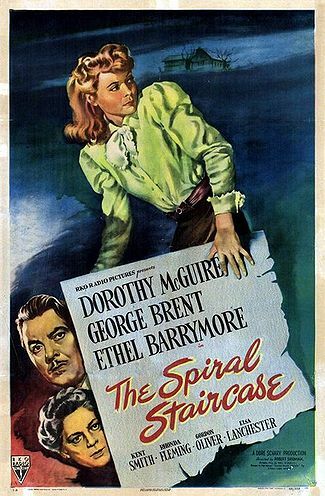 The Spiral Staircase is based on the 1933 novel, Some Must Watch, by Ethel Lina White, a popular crime author who also wrote the novel that was the basis of director Alfred Hitchcock's The Lady Vanishes (1938). Independent producer David O. Selznick bought the novel as a vehicle for his No. 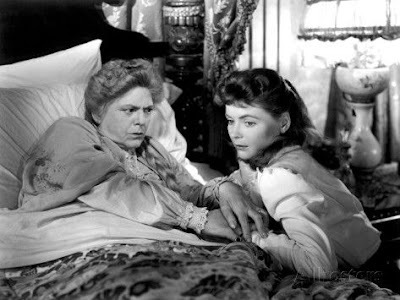 1 star, Ingrid Bergman, but when Bergman's contract ended before she could make the movie, he sold the rights to RKO Pictures in exchange for a share of the profits (in the same deal, Selznick also sold The Farmer's Daughter (1947), another movie originally intended for Bergman that features a great performance from Barrymore). The Spiral Staircase was directed by Robert Siodmak, a veteran of noirs and thrillers, who was loaned out from Universal Pictures for the project. Siodmak and cinematographer Nicholas Musuraca bring a distinctive style to The Spiral Staircase that is based on Siodmak's roots in German cinema with its use of shadows and angular spaces, and Musuraca's expertise in deep-focus photography. Siodmak's famous close-up of the killer's eye has been widely imitated ever since the film's release, showing up in everything from A Clockwork Orange (1971) to the TV series, House. Dorothy McGuire in The Spiral Staircase (1946). For her part, Barrymore enjoyed making The Spiral Staircase. 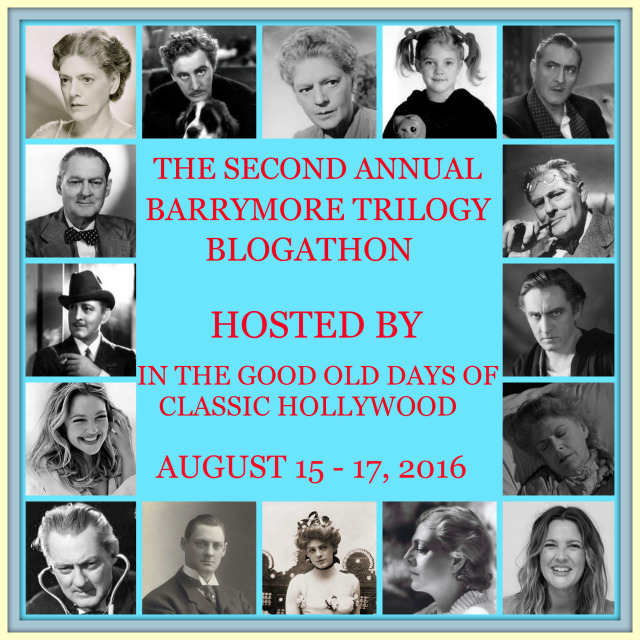 After an unhappy time during the making of Rasputin and the Empress (1932), Barrymore had only worked on the stage until she was lured back to the movies for her Academy Award-winning performance in None But the Lonely Heart (1944). Barrymore had previously worked with Smith and Rhys Williams, who plays the disheveled butler, and she thoroughly enjoyed working with the rest of the cast, especially her fellow theatrical veteran Sara Allgood who plays a gruff nurse. Barrymore also greatly enjoyed working with Siodmak, and they formed something of a mutual admiration society. Barrymore appreciated Siodmak's professionalism and his careful work with the actors, which reminded her of how the best theater directors went about their craft. Barrymore was filled with praise in interviews for The Spiral Staircase, saying in one article quoted in the TCM database that "when I made Rasputin and the Empress out here years ago they kept shoving me my dialogue on the backs of old envelopes. Now they do things right." For his part, Siodmak always stated that working with Barrymore was what he most enjoyed about making the film. The Spiral Staircase was a massive hit in 1946, and it remains one of the most entertaining old Hollywood ever made 70 years after its release. In fact, it's a good "gateway" movie for those who haven't watched classic films. The movie is filled with classic horror film tropes like creaking footsteps, candlelit rooms, cobwebbed staircases, and an unknown killer stalking around a creepy mansion, but it is also a good way to introduce audiences to the technical and artistic brilliance of old Hollywood films. The photography is immaculate, better than what you will see in most of today's CGI created films, and the performances are top-notch, especially from McGuire and Barrymore. The Spiral Staircase is available on DVD. I saw this film about a year into my discovery of the classics and it blew my mind. It terrified me a lot, which admittedly doesn't take much, and a lot of its images have stayed with me, particularly the close-up of the murderer's eye. This is one I have to watch in daylight! The identity of the killer completely surprised. I was not expecting it to be that person. Wonderful review! It was nice to know Ethel and Siodmak got along well during the making of the film. I wonder what she could have been in between 1932 and 1944. Yes, I think if Ethel had stayed in films in the 1930s she would have won several more Oscars than the one she received for None But the Lonely Heart.